Immediately after California, New York adopted a $15-an-hour minimum wage, followed by the District of Columbia. The New Jersey legislature recently approved a $15-per-hour minimum and lawmakers in Connecticut, Vermont, and Massachusetts are considering $15 minimums. Earlier this year, Oregon adopted a $14.75-an-hour minimum wage. However, a political puzzle needs examination. Last year the Governor and the legislature’s Democratic leadership opposed a $13-an-hour minimum-wage bill (phased in by 2017) introduced by State Senator Mark Leno. Why a $15-per-hour minimum wage a year later? To answer that we must analyze the grassroots movement for economic justice that began twenty years ago and has now ‘scaled up,’ forcing California and other states to act. Over the last three decades California and the nation have experienced a ‘generation of widening inequality.’ According to the California Budget and Policy Project, between 1979 and 2014 the average income of the top One Percent increased by 125 percent while that of the bottom four fifths declined. Even worse, during the recovery from the Great Recession, the One Percent captured 95 percent of the income gains. At the same time, the real hourly wages for the bottom 60 percent of the working population fell, according to UC Berkeley Labor Center researchers. Moreover, 44 percent of the jobs created in the recent recovery have been low-wage, paying less than $14 an hour, according to the National Employment Law Project (NELP). The number of California workers earning such low wages jumped from 26 percent in 2006 to 33 percent in 2014. Only one in five jobs created after 2010 was mid-wage, paying between $14 and $20 per hour. The California Employment Development Department projects that between 2012-2022 seven of the ten top job-growth occupations will be low-wage service- sector jobs. Neither the state nor the federal government has acted to reverse declining wages, particularly to address the falling value of the minimum wage that is not adjusted annually for inflation. If the California minimum wage were adjusted each year since its peak value in the late 1960s, it would be nearly $12 an hour today. The Living Wage movement began when Baltimore implemented the first Living Wage Ordinance in 1996, requiring that city workers and city contractors’ employees receive a wage commensurate with the cost of living. Los Angeles enacted California’s first Living Wage law in 1997, and 35 California cities and counties have followed suit. In each of these campaigns, Living Wage advocates organized local coalitions of labor, faith, and community organizations, who educated the public and elected officials about the rising number of working poor, the real costs of living, and what local governments could do in the face of state and federal inaction. The idea behind the Living Wage is that when public services are contracted out or subsidies provided to private firms, taxpayer dollars should create good full- time jobs with benefits and ensure that workers’ rights are protected. In California over the last 15 years, each local government-approved Living Wage law has increased hourly wage rates, raised labor standards, and expanded worker protections. Santa Clara County approved the highest and most comprehensive Living Wage law in the state in 2015, mandating a $19-per-hour wage for covered workers or $17 per hour if a county contractor provides affordable health care benefits. The Santa Clara ordinance requires that county contractors provide 12 paid sick days per year, ensure predictable and regular employee schedules, and offer more hours to part-timers who want full-time work before hiring new part-time employees. Also, county contractors must retain qualified employees when a service contract changes hands and may not interfere if workers attempt to organize a union. In 2011 the financial crisis and continuing concentration of wealth by the upper One Percent ignited the Occupy Wall Street movement. Occupy protestors established tent encampments in more than 600 communities across the nation. More than one third (143) of all incorporated cities in California experienced Occupy encampments in 2011-2012, according to UC Irvine researchers. Occupy ended, but the movement spilled over into a variety of new campaigns for financial regulation, opposition to police brutality, halting evictions and gentrification, and ending student debt. It also lent energy to the minimum wage effort. In 2012, fast-food workers in New York – among the worst paid of all low-wage workers – participated in a one-day strike demanding $15 per hour and a union. At first the demand for $15 – double the federal minimum of $7.25 – seemed a utopian dream, according to Occidental College professor Peter Dreier. 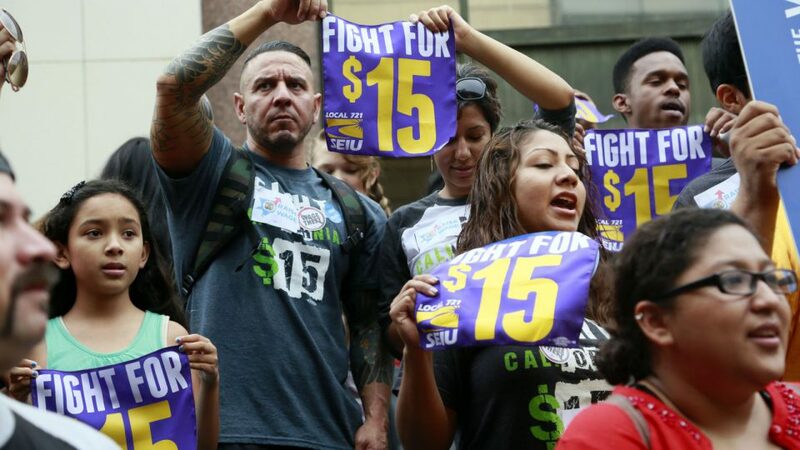 Unexpectedly, the fast food strikes ignited the “Fight for $15” and bi-annual nationwide demonstrations. Fast-food workers in California and elsewhere were joined by thousands of low-wage adjunct professors, janitors, Wal-Mart, childcare, home care, and airport workers. In December 2014, low-wage workers walked off their jobs in more than 190 cities nationwide, and solidarity actions took place in 36 countries and 93 cities worldwide. In San Francisco, Oakland, Los Angeles and San Diego, low-wage workers and their supporters participated in sit-ins and civil disobedience at McDonald’s and Wal-Mart stores. Meanwhile, Seattle approved the first $15 an hour law covering all minimum-wage workers in 2013, followed by San Francisco in 2014 and Los Angeles in 2015. NELP reports that more than 30 cities–half in California–have implemented citywide minimum-wage laws ranging from $13 to $15 an hour. In 2015 the demand for a $15-an-hour minimum wage had entered the mainstream in California, particularly as wages stagnated and rents skyrocketed across the state, particularly in coastal California metro regions. An explosive combination of low wages and high rents is driving the worst rental-housing crisis in California since World War II. Between 2000 and 2014, median renter household income fell 7 percent while median rents jumped 24 percent, according to the California Housing Partnership Corporation. Rents in California are increasing at twice the rate of rents nationwide. No wonder that six of the nation’s ten most unaffordable metropolitan rental markets are now in California (San Francisco, San Jose, Orange County, Oakland, Los Angeles, and San Diego). As a consequence, the Fight for $15 in many California cities has become a movement demanding both fair wages and fair rents. While working people are being squeezed at both ends, the myth that business cannot afford higher minimum wages has been under assault. The argument against raising the wage floor has long been that it will ruin small businesses, but, in fact, large corporations such as Wal-Mart, McDonald’s, Taco Bell, and Aramark employ two thirds of all minimum-wage workers. These companies dominate the low-wage food services, retail, hospitality and leisure sectors, even as they paid their CEOs in 2011 an average $9.4 million annually and their “profits are at near record highs relative to GDP”, according to the March 26th Economist magazine. A recent University of Massachusetts study demonstrates fast-food giants like McDonald’s could easily adjust to a $15-per-hour minimum wage without cutting profits, by slightly increasing prices (15 cents per Big Mac) and by realizing cost savings from declining employee turnover and increased worker productivity. Over the last several years, there has been an upsurge of union organizing by low-wage workers. This has included Bay Area security guards, shuttle bus drivers, and food service workers; Los Angeles hotel staff, warehouse workers, and truck drivers; and casino workers and part-time private college instructors across Northern California. Strong public support for the Fight for $15 inspired the “Silicon Valley Rising” campaign that has helped workers there to join unions like SEIU and the Teamsters and to win contracts with job security, grievance procedures, excellent wages, and benefits. UNITE HERE recently organized 600 casino workers at the Sonoma County Graton casino and resort, raising entry-level compensation to more than $20 per hour including benefits—and 600 more restaurant and hotel workers will soon join the union. Senator Bernie Sanders won 23 Democratic primaries and caucuses by focusing on major reforms that address economic inequality. Though he lost the California June primary to Hilary Clinton, Sanders introduced legislation to increase the federal minimum wage from $7.25 an hour to $15, and championed this issue throughout his campaign. Sanders and his appointees on the Democratic Party platform committee pushed hard to ensure that the platform included a $15-per-hour federal minimum wage. The committee has officially approved a $15-an-hour federal minimum, and in her speech at the Democratic convention accepting the Presidential nomination Hillary Clinton declared, “the minimum wage should be a living wage and no one working full time should have to raise their children in poverty.” Boosting the federal minimum wage is now a major issue in the November Presidential elections. By early 2015 proponents for raising the California minimum wage had collected signatures to place a $15-an-hour minimum-wage initiative on the November ballot. An August 2015 Field Poll indicated that 68 percent of registered California voters support incrementally raising the state minimum wage to $15 by 2021. A 2016 poll by the Public Policy Institute of California revealed that nearly 60 percent of likely voters believe that the government should do more to address the widening gap in the state between the rich and the poor. The Governor and Democratic legislative leaders certainly understood that a well-funded and highly organized statewide network of labor, faith, and community organizations would coalesce to support the $15-an-hour minimum- wage ballot initiative in the fall, as they did in 2012 to win voter approval for Proposition 30, a tax increase on the state’s wealthiest residents to pay for public education and public services, and to successfully oppose Proposition 32, an anti-union ballot initiative that would prohibit unions from using member dues to fund political campaigns. A similar “tax the top” initiative will be on the November 2016 ballot and this statewide network undoubtedly would mobilize working-class, youth, new-immigrant, and minority voters to support both the tax measure and the $15 per hour minimum wage. Given the certain approval of a sweeping $15 minimum-wage ballot initiative in the fall, the Governor and the legislature wisely and quickly acted to approve a $15-an-hour minimum-wage bill in April. San Francisco has already implemented a citywide minimum wage that will reach $15 per hour by 2018. The City of San Jose and twelve other cities in Santa Clara County just agreed to raise their citywide minimum wage or approve a $15 –an-hour minimum wage by 2019. The cities of Los Angeles, Santa Monica, Long Beach, and Pasadena, and Los Angeles County will phase-in a $15-per-hour minimum wage by 2020. If other California cities and counties phase-in $15 an hour before the state’s current target date of 2022, the legislature will be pressured to reach $15 much sooner. Moreover, the next Presidential election cycle in 2020 could become an historic opportunity for California, particularly if the Sanders campaign develops an enduring presence within the state and national Democratic Party. One possibility for 2020 is a ballot initiative to implement a state single-payer universal health- insurance plan, such as Colorado voters will consider this fall; another is a ballot proposition to amend the Proposition 13 provisions that shield commercial real estate from reassessment. In future statewide campaigns Progressives should heed the lessons of the California $15 minimum-wage campaign: only a grassroots movement from below based upon a bold vision for structural reform can change public opinion and pressure government to act. The California minimum wage earthquake is shaking up state and national politics.